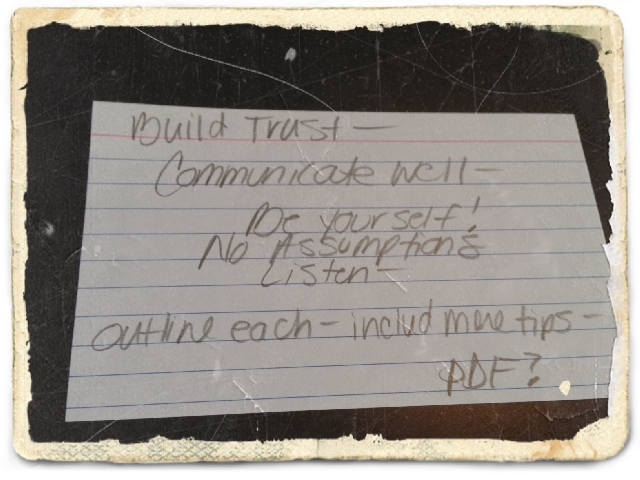 Communicate Well and Build Trust. This question was presented to me about two years ago and until now, I have not “bottled” anything except for a few growlers of homebrewed beer. Why do customers trust me? Why do they still ask about me, years, even decades after our last contact? I am the person you meet, regardless of the situation, the environment, the vibe, the agenda, the hierarchy, or status. I am always myself. If I meet you for the first time at a funeral, a ribbon cutting ceremony or a pub tap take-over: SAME PERSON. Let’s put that in the bottle: Be yourself, always. Next, let’s dig deeper in to “trust”. Why do people trust me? My belief, is that I am honest, able to say “I don’t know” and I make NO ASSUMPTIONS about who you are, what you think, or why you are sitting across the desk or table from me. Even if you TELL me, “I want to meet with you to discuss our content strategy for Q2”, I walk in a blank slate. In the bottle: Begin as a blank slate. This means, I do not make assumptions on what you might say or do, nor do I make assumptions on what I might say or do. Now, this takes practice. The art of simply being prepared for where a conversation may take you requires some work. Additionally, I do not plan to solve any of your problems or sell you anything, ever. I have no agenda or path I want to lead you down. However, I am prepared. Lastly, I will introduce the probable “magic bullet”, which is: Listen. I listen to you. Let’s put that in the bottle: Listen. Cell phone: is in the car. This is difficult, especially when your potential client drops a big fat problem in your lap. Your initial reaction is to solve it, or promote the solutions you have that can solve it. Don’t. Keep listening. The client does not know they have just launched an opportunity at you, and they probably are not done talking, and most of all… if you jump in, you make them feel as if they are silly and uninformed. Let it be. Let the conversation flow. Follow up with the solutions later, in writing, and then with a phone call or visit. Now they are feeling heard, listened to, understood. Jumping at every problem they present makes them feel challenged, so don’t do that. Here is a TED Talk which provides brilliant, high level techniques on communication, problem solving, personal growth, and success. WARNING: as with any TED Talk, this will probably make you stand up and cheer. You’ve been warned.